This post was inspired by a visit to my parents’ place. When I was there recently making something for the kids to eat, I asked my dad where the kitchen shears were. He said they didn’t have any. I said, “Whaaat? ?” We seriously have three pairs and use them all the time! So, in today’s post, I’m sharing all the reasons why I love my kitchen shears so much (and how they help me make real food)! I seriously don’t know if I could function in the kitchen without them. Would you agree? 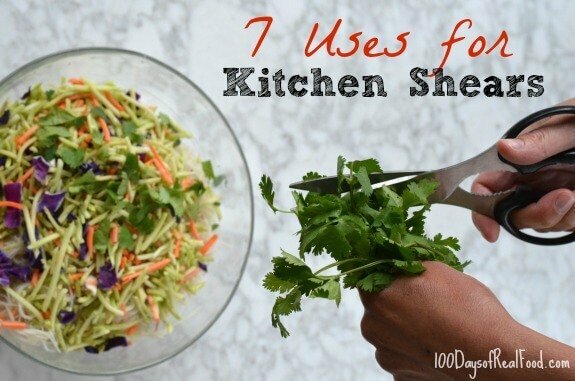 Most of us know how incredibly difficult it is to cut freshly washed herbs with a knife. The trick is to bunch them up, but, especially when they’re still wet, I end up with cut marks and no actual cuts on the bottom layer. Enter kitchen shears! The job seriously couldn’t be easier with these. Hold them by the stem and slice away. The beauty of using scissors to cut hot peppers is that you don’t get the spicy stuff all over your fingers (and inevitably in your eyes…ouch!). Greens are a little easier to wrangle on the cutting board, but let’s say I’m just making a small salad for myself for lunch. Maybe I don’t want to get a whole big cutting board dirty. So, using the same technique as with fresh herbs, I just dangle the lettuce over my bowl and – voila – quickly cut it into ribbons. I’m sure Italians will cringe to hear me say this, but sometimes full-length spaghetti noodles just make a mess in my house. So once they’re cooked and drained, I often stick my scissors down into the colander and make a few cuts so the meal is more manageable for my little ones. This use may be a more obvious one, but I had to include it just in case. If you’re dirtying a cutting board (see #3 above) to trim off your unwanted green bean ends, you can stop now! I like to hold at least a half dozen in my hand at a time and use my scissors to cut off the ends. This is also a great kitchen chore for little ones, although I’d recommend they just cut one at a time. I usually cut pitas in half and sometimes even into little triangles (if we want to dip them in something like hummus), and there is seriously no better way to do it than with scissors. In fact, I think that’s what I was trying to do at my parents’ home that inspired all of this in the first place! Every once in a while I’m cooking something in a hot pan and decide, “Oh, I should have cut up those onions more,” or “I wish I would have sliced those mushrooms a little smaller so the kids don’t try to pick them out.” Well, you guessed it. If you have kitchen shears on hand, you can just stick them right down in the pan, and it can be taken care of in seconds! If you have never seen these, they are fantastic for herbs, other veggies likes chives and more! Love them. Just got them not long ago and makes things go much quicker when food prepping! I actually just break my noodles in half while they are dry. It’s easier and cleaner than cutting them after they are cooked, plus you get more consistent results. I use them to cut raw chicken breasts into strips or tenders. they often work better to cut pizza or even quesadillas than a pizza cutter! Funny enough a local restaurant here serves their pizzas with a pair of scissors for cutting! I use them to cut up waffles & pancakes for the kids. I’m currently living in Korea, and kitchen scissors are essential here. Our apartment was furnished when we moved in-our utensils consisted of chopsticks, spoons, knives, kitchen scissors, tongs, and a spatula. It is also a main tool for Korean BBQ-there are different methods, but we use tongs for the raw meat (which is usually served in very large pieces), cook it, then use the scissors to cut the meat into bite-size pieces. I use them all the time when making my kids’ plates! I often do that with cooked noodles. That way hubby gets long noodles and the kids aren’t so messy. I use them all the time for cutting packages open, such as bacon, frozen fruit, bags of dried beans, those mesh onion bags, stuff like that. do you have a particular brand you like? Where do you buy them? I need some!! Umm I never thought about using kitchen shears for pitas. But one of the things I love to use them for is cutting up bacon that I want to render down to season a dish! No dirtying up a cutting board with nasty porky bacon fat! The item I can’t live without but that others don’t see as essential is TONGS! – Remove large items from boiling water, like corn on the cob, lobster, boiled potatoes, boiled eggs, etc. I was just thinking about trying them out on a dish I am going to make for this weekend when I saw this post pop up on my feed! It calls for cherry tomatoes and I was thinking how it might be easier to quarter or half them with shears! No more squirting seeds/tomato juice! …the bags of greens from TJ are a lot easier to open with shears. I cut up chicken to sauté for Thai food. I use shears to cut raw or partially frozen chicken tenderloins into bite size chunks. Anything in a can that you want in smaller pieces, like stewed tomatoes. Just put the shears down in the can or jar & make a few cuts. Lisa – You forgot grapes, and opening vac-packed meat packages! We always cut our bacon in half while still in the package, it cooks better that way. I use them to cut the backbone out of a whole chicken so I can roast flat (much quicker way to cook a chicken and no rubbery undercooked skin). I love this post … and the one about the tongs! A pizza cutter makes quick work of cutting pancakes, waffles, even noodles (if on a plate!). I learned this invaluable tip when working as a camp counselor with a table full of hungry little ones! We have 4 pairs of kitchen shears. I use them all the time to cut up my toddler’s meals into bite sized pieces. I have a really good pair that cuts through bone and gristle well, we use them just for cutting poultry and meat. Ditto on the chives/herbs I walk out to the garden snip some chives with my shears, rinse the chives and then snip them directly over the plate/bowl in need of garnish. Aside, my Mom snapped spaghetti in half my WHOLE childhood and I didn’t learn to properly twist pasta until I was in COLLEGE! I started teaching my girls how to twist pasta once they were around 3 and now my 8 and 5 year old can do it independently, while the 3 1/2year old is learning. Spaghetti and meatballs night is still a little messy, but practice makes perfect. For practice without the RED (sauce), try spaghetti carbonara instead. LOL Nice to know I’m not the only one who does number 7! I often decide I want something chopped smaller, after it’s in the pan! I also love kitchen shears for trimming the fat off and slicing/cubing raw meat. SOO much easier than using a knife! These ideas are great! I NEVER use my kitchen shears, but now will. I use mine for cutting large pizzas into smaller triangles – and triangles into bite sized pieces for my toddler. Everyone makes fun of me for “cutting” my pizza with them but I love it! You know it cuts all the way through! For opening bags, boxes and such. I don’t pry open anything. Hurray for scissors! You just opened up a whole new world for me in the kitchen! I never use those shears in my kitchen, but know I can’t wait to grab them for salsa, spaghetti, etc! Much thanks!! I use mine to cut homemade pizza into nice, smaller pieces for my little one. A pizza cutter seems to squish it into an unappetizing blob. The shears make nice little squares that are still pleasing to the eye. It’s hard to get veggies into little ones as it is, let alone when it “looks” nasty!! I use them to cut up or clean up raw chicken. So much easier than with a knife. Actually any kind of raw meat can be cut up this way. Seriously. When we were visiting a friend in Italy, they grabbed their scissors and cut a large size pizza into slices! To our awe and disbelief (and laughter), it worked great! we love them for breakfast food! trying to get three plates made quickly is much easier with shears! Pancakes into bite sized pieces, french toast, i’ve even used them on omelets! lol LOVE kitchen shears! Cutting up a chicken — a good pair of shears makes parting the breasts from the back a breeze! Cutting whole chicken into parts- be it raw needing freezer prep or cooked and needing to be serving sized. We have three pairs as well and use them for tons of things — but I think it’s a generational thing… we bought a pair for my in-laws… they use them on paper haha!! !